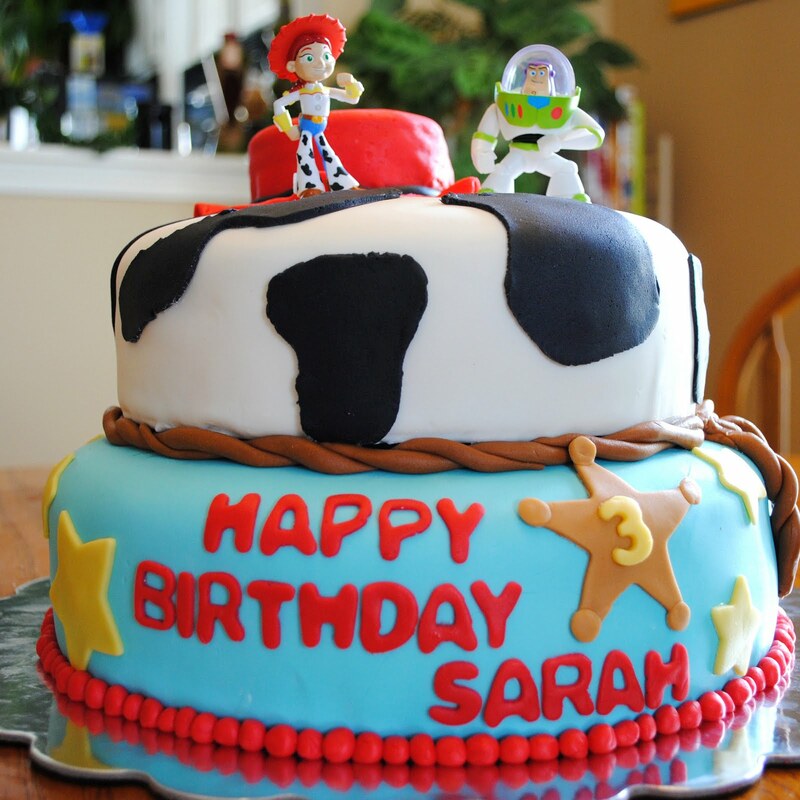 This cake was so much fun to do - the more I work with fondant, the more I really like it. You can do so many fun things with it because it creates such a clean back drop to layer anything on. For this cake - the birthday girl loves Toy Story's Jessie so that's what inspired the cake. I used a couple figurines that I picked up at Walmart to top the cake since sculpting them was a challenge I didn't want to undertake for this cake. I used toothpicks to attach these to the top of the cake since there was a small hole in the bottom of one foot of each character. As I've mentioned before I really like to use marshmallow fondant for cakes. Marshmallow fondant has several advantages - it tastes a million times better than the store bought stuff, it's a lot cheaper, and it can be made in just a few minutes and stored for quite a while at room temperature. You will want to let it rest after mixing it up for at least a few hours or overnight before working with it. 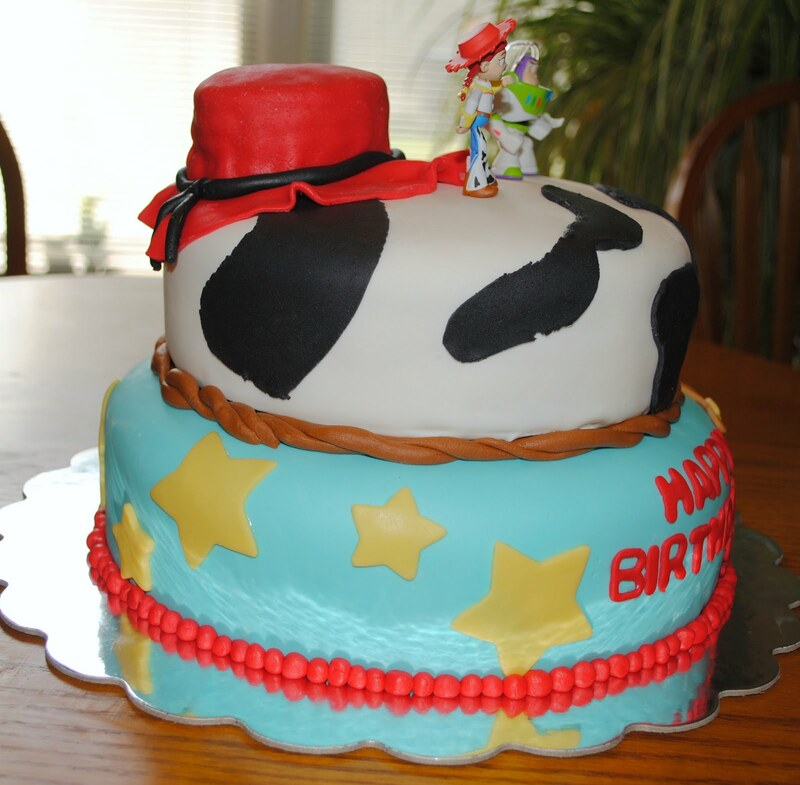 One thing to keep in mind when you use fondant, is that you will likely want to do something as a border in between your cake layers. 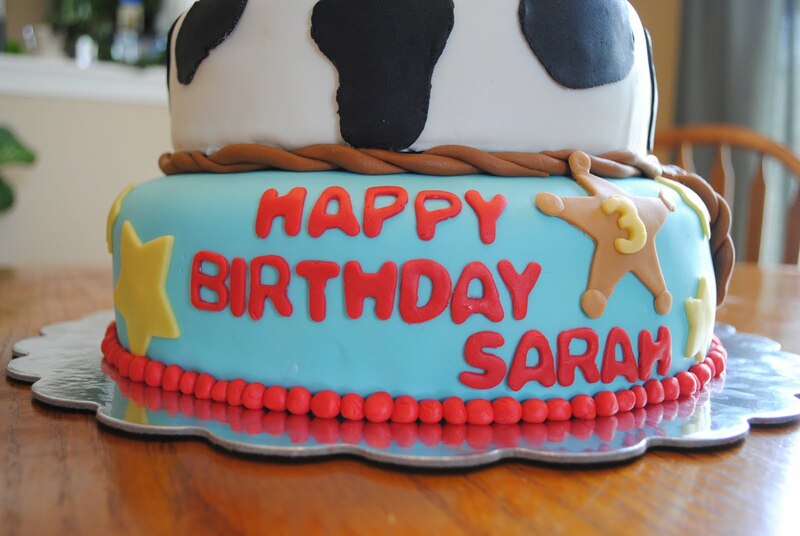 While fondant creates a very clean cake, the edges can sometimes leave a little to be desired. For this cake I twirled two strings of brown fondant into a rope border and rolled red fondant into tiny balls to make a border for the bottom layer. You can use any regular cookie cutter to make cutouts for fondant - I used several different sized stars for the base layer, a set of alphabet cookie cutters to do the writing so that everything would be a uniform size and made freehanded cutouts for the cow print using a small wheel cutter. Depending on the humidity on the day you make this, you may have to adjust the water to powdered sugar ratio slightly but this is a good starting point from my experience. You'll also want to have plenty of shortening on hand to keep the fondant from sticking to your hands and the surface you use to roll it out. I've only ever done this with a stand mixer, I'm sure it can be done by hand but it's going to be a lot more time consuming. Begin by liberally greasing a microwave-safe bowl to melt the marshmallows in, a large spoon, mixing bowl of your stand mixer and the dough hook attachment. Add all but about one cup of powdered sugar to the mixing bowl and make a well in the center. Add marshmallows and water to the microwave-safe bowl and heat about one minute in the microwave. Stir and continue heating another 30 seconds to a minute until melted. Add vanilla and stir to combine. Pour melted marshmallow mix into the powdered sugar and begin mixing on low speed. When mixer begins to sound strained, turn up the speed a notch. Mix until all the sugar is incorporated. If mixture is too dry, add water, half a teaspoon at a time, mixing after each addition until all the sugar is incorporated. If mixture is too sticky, add remaining powdered sugar. Coat hands with shortening, transfer mixture to a large sheet of plastic wrap, kneading into a ball. Coat fondant with shortening and wrap tightly. Either wrap in a double layer of plastic wrap or slide plastic wrapped ball into a large Ziploc bag. This yields about three pounds of fondant which is approximately enough to cover two eight inch, two-layer cakes. 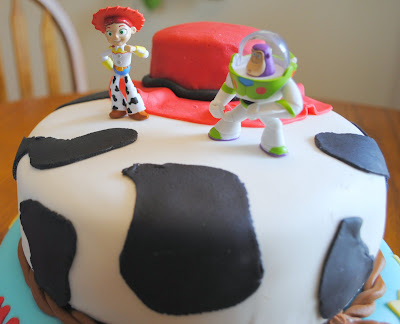 I dislike store bought fondant but love the look of fondant cakes, going to give this recipe a try. - Thanks for sharing, the cake is amazing ! That is full of awesomeness. Very, very nice. Great job! 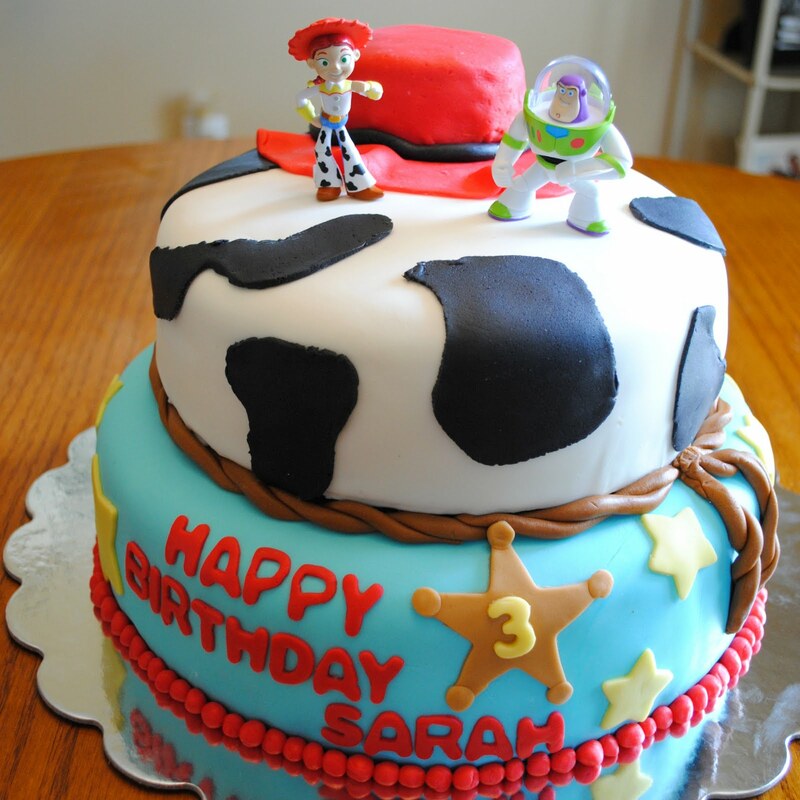 The cake is so bright and colorful, and you really nailed the Toy Story theme! LOVE LOVE LOVE this cake! You did a great job- you really have a great eye- I work with fondant a lot, but don't nearly have the creative, designer ideas that you came up with! This is so stinkin’ cute! Excellent choice for the color scheme and Toy Story characters. Very detailed I love the way everything meshed together so perfectly – Two thumbs up!